Huang Shui-wen is an Eastern gouache painting as well as a distinguished writer and poet. He studied in the Tokyo School of Pure-Land Buddhism under Master Lin Tung-ling, and subsequently took art lessons under Lin Yu-shan and studied Chinese classics under Lai Hui-chuan. Huang Shui-wen was a member of many arts and culture groups such as the Seagull Society, the Readers Society, the Spring Painting Society, Chinese Association of Fine Arts, Long River Painting Society and the ROC Society for Classical Poetry. He has won several awards at the Taiwan Arts Exhibition, Taiwan Governor General Arts Exhibition and Taiwan Provincial Arts Exhibition, and served as a member of the consultant or assessment committee for various arts-and-culture institutions and exhibitions. Huang also taught art at the secondary school and served as a board member of the Taiwan Association of Eastern Gouache Painting. His paintings, which often portray small animals such as pigeons and dogs in a meticulous, naturalistic style. Three of his paintings – The Sunflowers, The Spring, and Early Summer in South Taiwan, are collected by the National Taiwan Museum of Fine Arts. 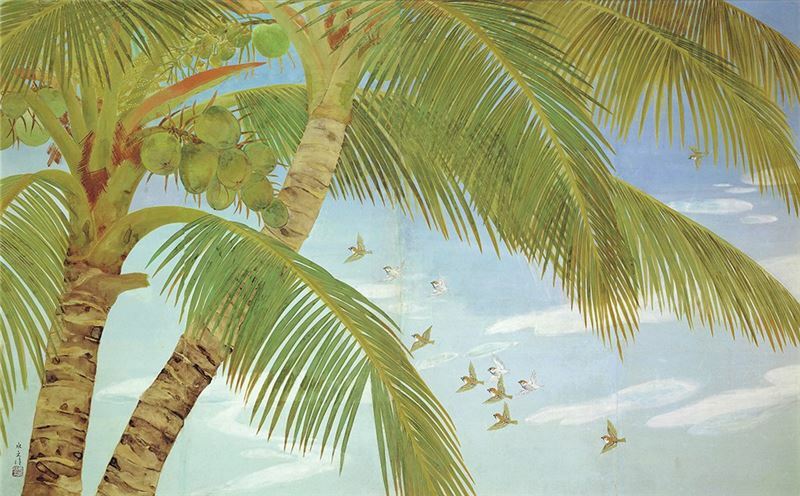 Early Summer in South Taiwan (1940) portrays the beautiful, tranquil scenery of Southern Taiwan in the bright summer sun. Huang Shui-wen's works are characterized by a strong sense of local color with extra attention directed to the native plants and pastoral scenery. His plein-air paintings are mostly executed in a style of realism, creating three-dimensionality using color and shading. 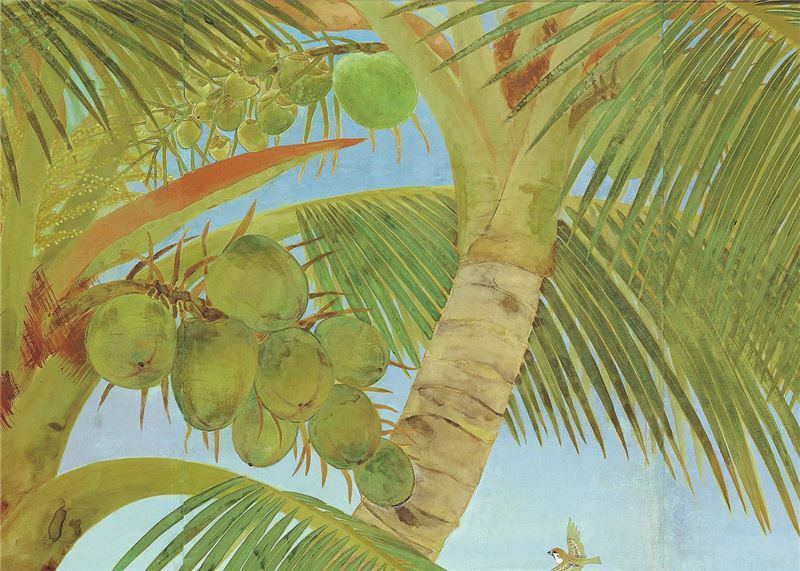 The two towering coconut trees indicate the location of the painting i.e. 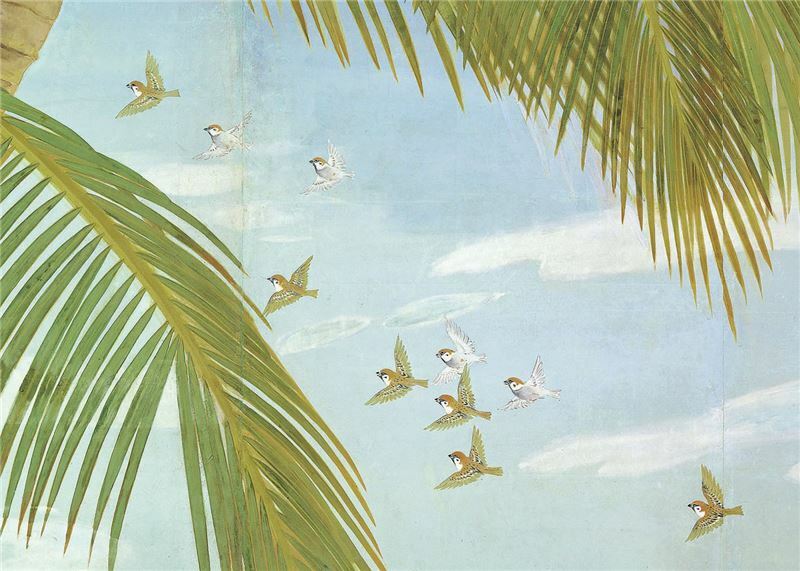 Southern Taiwan, the flourishing trees signifies the summer season and the birds flying in the sky gives the painting a feeling of calm and relaxation. Around the time this painting was created, the entire world was embroiled in the beginnings of WWII, with Japan invading China and Nazi Germany occupying France. To consolidate colonial rule, the Japanese colonial government embarked on an imperialist campaign to Japanize Asia – a standardization program often referred as “Tennoization” (kōminka), which literally means "to make people become subjects of the emperor". The program essentiall involved the "national language movement" (kokugo undō) promoted the Japanese language by teaching Japanese instead of Chinese in the schools and by abolishing the use of Chinese in the press. Second, the "name changing program" (kaiseimei) replaced Taiwanese's Chinese names with Japanese names, as well as abolishing the use of the traditional lunar calendar. The Japanization program had a significant impact on the arts and culture in Taiwan. 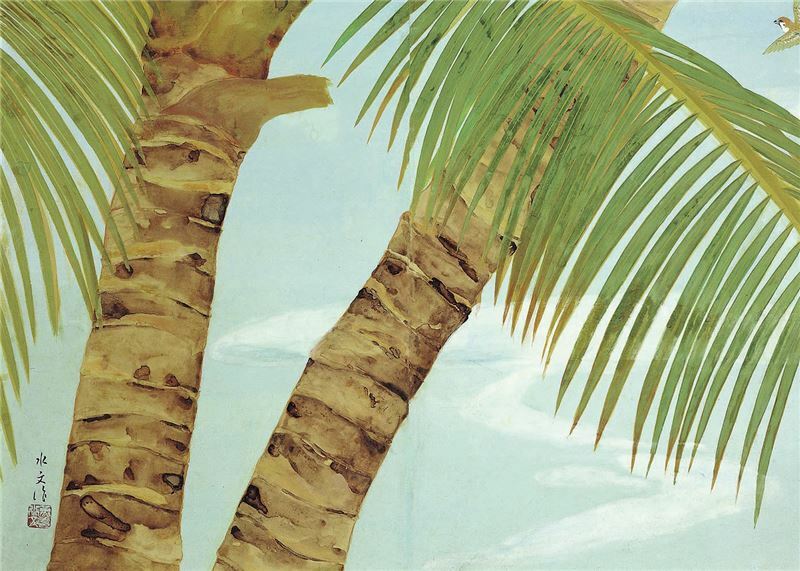 Despite the colonial government's efforts to surpress Taiwanese culture, Taiwanese artists preserved the local heritage by painting local scenes, landscapes and figures in a style of realism.